…the American colonists did not attempt to abolish the British government; rather, they "altered" it by withdrawal of the colonies from its authority. In brief, they seceded from Britain. As such, the right of secession lies at the heart of our country's legitimacy. Deny it, and you must reject the American founding. But if they have set limits to the duration of their legislative, and made this supreme power in any person, or assembly, only temporary; or else when by the miscarriages of those in authority, it is forfeited; upon the forfeiture of their rulers, or at the determination of the time set, it reverts to the society, and the people have a right to act as supreme, and continue the legislative in themselves, or erect a new form, or under the old form place it in new hands, as they think good. In 1770 Reverend John Lathrop, of Boston’s Old North Church, stated in a sermon during the Boston Massacre that “The voice of thy brother’s blood cryeth unto me from the ground.” Lathrop, as did many of Colonial clergy, believed that if government failed in its purpose of upholding liberty, it must be abolished and a better government established. Many of the clergy were pushing for a separation from England. In 1772 an anonymous pastor wrote in an article in the Boston Gazette “that the Americans would be justified in the sight of Heaven and before all nations of mankind, in forming an independent government of their own.” It is as if this clergyman was paraphrased by Jefferson himself in the Declaration of Independence only four years later. The Colonial ministers, especial rolling into the late 1760s and early to mid-1770s, were simply on fire with the spirit of the Revolution. They were often yielding significantly more recruits for militia than recruiting officers. “In the months before the battle of Lexington, minister after minister, as if in preparation for the coming struggle,” writes Dr. Alice Baldwin, “called upon the men to be of stout heart and good courage, ready to wield the sword of the Lord.” One patriotic pastor, Samuel Eaton of Harpswell, Maine, delivered a fiery sermon declaring, “Cursed be he that keepeth back his sword from Blood.” As a result over forty men volunteered. 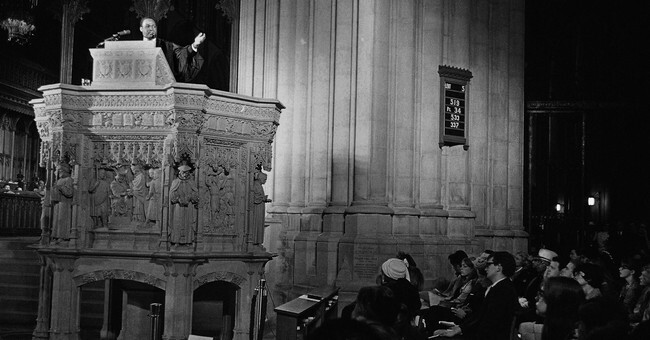 The Colonial pulpits were on fire –with the fire of freedom, liberty and independence. Alice M. Baldwin (Joel McDermon, ed. ), 2014 (originally published in 1928), The New England Pulpit and the American Revolution (originally titled, The New England Clergy and the American Revolution), (Powder Springs, GA: American Vision Press), p. 109. David Gordon, December 5, 2012, “Is Secession a Right?” Mises Daily, (Auburn, AL: Ludwig von Mises Institute), [http://mises.org/daily/6302/Is-Secession-a-Right]. John Locke, 1982, ed. Richard Cox (originally published in 1690), Second Treatise of Government, “Book XIX: Of the Dissolution of Government, Sec. 243,” (Wheeling, IL: Harlan Davidson, Inc.), p. 148. Alice M. Baldwin (Joel McDermon, ed. ), 2014 (originally published in 1928), The New England Pulpit and the American Revolution (originally titled, The New England Clergy and the American Revolution), (Powder Springs, GA: American Vision Press), p. 141. Alice M. Baldwin (Joel McDermon, ed. ), 2014 (originally published in 1928), The New England Pulpit and the American Revolution (originally titled, The New England Clergy and the American Revolution), (Powder Springs, GA: American Vision Press), p. 145. Alice M. Baldwin (Joel McDermon, ed. ), 2014 (originally published in 1928), The New England Pulpit and the American Revolution (originally titled, The New England Clergy and the American Revolution), (Powder Springs, GA: American Vision Press), p. 158-159.